The Samsung Galaxy Note 9 gets officially unveiled tomorrow at Samsung's Unpacked event in New York. And, after months of leaks, there is very little we actually don't know about the hot new handset, with its official specifications, refined new design, brand new S Pen digital stylus, and even its price point in certain territories already out in the open. Hell, we even know exactly when the Samsung Note 9 will hit store shelves — August 24. What we didn't know, though, is that US carrier Verizon is reportedly set to host a Buy One, Get One (BOGO) promotion for the Note 9 once pre-orders go live, which will almost certainly be on Thursday or Friday this week. But what precisely does it mean by that? The potentially amazing deal, which was reported on originally by DroidLife, was spotted by a reader who was browsing through the My Verizon app and clocked the super attractive promotion (see lead image), which presumably had been accidentally set live by mistake. 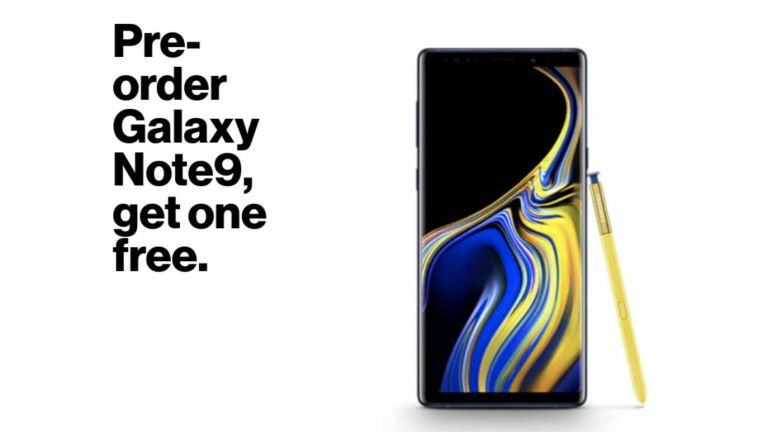 Read one way, it seems to clearly imply that if you buy a Note 9 from them, you get another one free. So you have a spare. Or maybe you're a small business looking to re-supply your sales force. Unfortunately the My Verizon app BOGO promotion leak didn't include a price point or the amount of stock that will be made available, so we could be looking at a very limited promotion in terms of available units or, as has been seen before, a discount on monthly bill costs to a total amount that is equal to that of a new Note 9. That said, other rumours have been circulating over the past couple of days that Samsung is not particularly confident in the ability of the Note 9 to sell out of the gate, so a landmark, super juicy deal like this does not seem totally out of the equation. Two Samsung Note 9's, both equipped with flagship hardware and next-gen features, for the price of one? That would be worth an all night vigil to score for sure. Of course, you might very well not end up with two Note 9s. Verizon might just be employing 'clever' wording and meaning that if you pre-order the phone you will get just 'one' for 'free' (ie: the upfront cost is absorbed into the contract pricing). Or even, looking at that image, that you get 'one' stylus 'free' with your Note 9. We suggest you keep your eyes glued to Verizon's website, as well as T3.com, over the next 48 hours.